A roadside bomb exploded near a military truck Monday night in northeastern Sri Lanka, killing 18 soldiers, the military said, as a senior Tamil Tiger rebel leader declared the country's cease-fire "null and void." Earlier Monday, government soldiers and Tamil Tiger rebels traded artillery shells and gunfire and the air force struck insurgent positions, killing at least 46 fighters, the army said. The clashes in Trincomalee and in Jaffna, a port on Sri Lanka's northern tip, were among the fiercest since the 2002 cease-fire, and were as close to open war as the two sides have come in months of back-and-forth attacks. Still, the government said it had not violated the cease-fire, insisting it only sent ground forces into Tiger territory to end a rebel blockade of a key water source. "Definitely not, we are not abrogating from the cease-fire," chief government spokesman Keheliya Rambukwella said. "Our military's operation to open the irrigation gates is purely based on humanitarian grounds. It is not an act of war." A leader of the Liberation Tigers of Tamil Eelam, the insurgents' official name, said the government's offensive amounted to a "declaration of war." "Therefore for us, the cease-fire is null and void," said Puratchi, a rebel commander in Trincomalee who only uses one name. Puratchi said he was speaking for the Tigers, although his comments could not immediately be confirmed by other rebel leaders. Monday night's explosion occurred in Kantale in Trincomalee district, about 135 miles northeast of Colombo, an official from the Media Center for National Security said. One other soldier was injured in the blast, he said. The Tigers took up arms in 1983 to fight for a homeland for Sri Lanka's 3.2 million Tamils, who have faced decades of often-violent discrimination. The resulting war on this tropical island of 19 million people — nearly three-quarters of them Sinhalese — left more than 65,000 people dead before the 2002 cease-fire. But peace talks have faltered, and rising violence has killed about 800 people, half of them civilians, since April, according to the Nordic cease-fire monitoring mission. The mission's chief, retired Swedish general, Ulf Henricsson said the truce was only on paper now. "In reality, there is no cease-fire agreement in this area in Trincomalee today, but the paper is still valid," Henricsson told reporters. "At the moment, none of the parties are interested in talks ... a full-scale war will be a disaster for both sides," he said. The root of Monday's fighting stretches back to July 20, when the Tigers shut a reservoir's sluice gate in an area under their control east of Trincomalee. The rebels control large swaths of the north and east. The move cut water to 60,000 people living in villages in nearby government-controlled territory, and the Tigers said they took action because the government reneged on a promise to build a water tower for adjacent rebel-held areas. Sri Lanka's military retaliated with four days of air strikes on rebel bases in the area, and then on Sunday deployed ground forces to take back the control point of the reservoir. But as the soldiers advanced Monday they met stiff resistance from Tiger fighters, and along with artillery and gunbattles, the military also renewed its air strikes, said military spokesman, Brig. Prasad Samarasinghe. Samarasinghe said 35 rebel fighters and seven Sri Lankan soldiers were killed in the fighting. The pro-rebel TamilNet Web site, however, said only three Tigers were slain, and put the military's death toll at 12, including two officers. Soldiers also fought the Tigers near Jaffna, in the traditional homeland of Sri Lanka's 3.2 million Tamils, after rebels fired mortars at troops. Four rebel fighters were killed, Samarasinghe said. 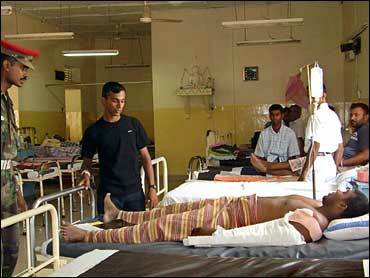 TamilNet made no mention of rebel casualties in the Jaffna fighting. Separately, a spokesman for the Nordic observers, Thorfinnur Omarsson, said the monitors had received no formal letter from the rebels saying they were pulling out of the cease-fire, although the insurgents did send notice they would retaliate against government troops trying to take control of the water supply. Observers saw fresh dangers in the latest violence. "This is a new development, as earlier fighting was more in the nature of hit-and-run operations," said Jehan Perera, an analyst at the independent National Peace Council. "The country is entering a deeper state of conflict."